Pictures of people emerging from a murky haze with facemasks firmly in place and satellite images showing a white cloud covering Beijing have been appearing regularly on Twitter and Facebook since the start of January. To those familiar with China these probably did not come as a shock, as Beijing has already gained a reputation abroad as being horribly polluted, with some even calling it ‘Greyjing’. 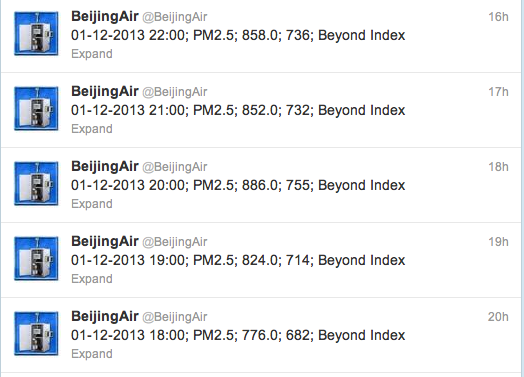 But the levels of pollution reached in January were astounding, even for ‘Greyjing’. On the 12th and 13th of January 2013, air quality in Beijing was the “worst on record”, with residents warned to stay indoors after levels of PM 2.5 – tiny particles that can penetrate into and through the lungs – surged well past the World Heath Organizations’ recommended daily level of 20. Readings increased steadily throughout the week, reaching a whopping 900 on the weekend. As one might expect, the topic has been discussed at length on online portals within China. People – including Ai Weiwei – shared pictures of themselves outside in the grey smog and posted screenshots of air quality indexes reading ‘beyond index’. “Off the charts”, “smoggy sky” and “#I don’t want to be a human vacuum cleaner” all became popular phrases on Sina Weibo, one of the biggest Chinese micro-blogging websites. What is different, however, is that the record-reaching pollution has also been reported in official media. The topic of air pollution in China has always been a sensitive one, with the Chinese media playing down the severity of the problem, often to the disgruntlement of the international press. Such was the case in 2008, when the international media accused the Chinese government of moving air-quality-monitoring stations and manipulating data after officials claimed to have significantly improved air quality in the run-up to the Beijing Olympics. Similar tensions were felt in 2012, when China accused embassies that collected data on air quality and reporting hourly PM 2.5 and ozone readings – as the U.S. Embassy in Beijing does – of being ‘inaccurate’ and ‘unlawful’. Yet this time the Chinese media have reported unflinchingly on the matter, including openly talking about the presence of PM 2.5, which went unacknowledged before 2012. State broadcaster China Central Television (CCTV) made poisonous air the lead item on its Sunday news broadcast on the 13th of January, and the Communist Party’s newspaper People’s Daily ran a front-page editorial on the subject. Plans to tackle the problem were also revealed on the 22nd of January, with Beijing’s mayor acknowledging the issue and pledging to take 180,000 old vehicles off the road this year, curb the “excessive” growth of new car sales, and replace some coal-burning boilers with clean energy systems. However these plans are already being criticized on Weibo, both for being insufficient and unlikely to be followed through with. This means that the levels of smog seen in early January might well become a recurring event in the city. China’s economic growth may be slowing but it has certainly not stopped, meaning that without tougher legislation, environmental problems are likely to persist. Companies with factories in China may well be asked to suspend production again, as the Beijing Hyundai Motor Company and others had to do earlier in January during the height of the pollution. Yet a much deeper problem is emerging, that of international reputation and recruitment. Beijing is now infamous for its pollution and the health issues that come with it, and it is becoming much harder for multinational firms to persuade their employees to move there. For now offering salaries that are 5 to 12 percent more than those paid to individuals working in comparable positions in places with a better environment is still enticing, but this may well change in the future. Facemask retailers, however, won’t be as keen to see the waves of haze go. Share prices of environment-related companies surged during the worst of the smog, with facemask producer Shanghai Dragon Corp soaring by its 10 percent daily limit after the Shanghai market opened. Alibaba was equally pleased, claiming to have sold 10,000 masks in Beijing on January 12-13 alone. Ranging from the trendy to the formidable, these are quickly becoming a must-have item across China. Fashion, at least, is keeping up with the smog.